AWWShawn Mendes Was Bullied For the Weirdest Reason! 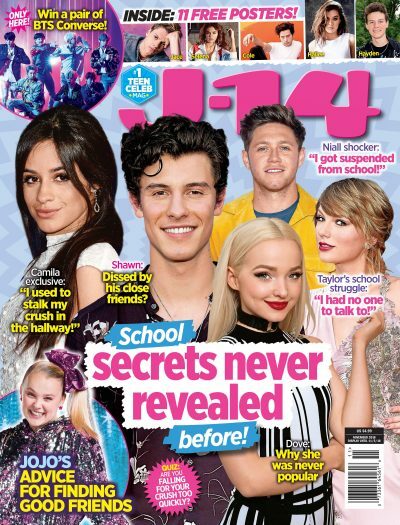 We want to give Shawn Mendes a hug right now — he recently confessed to J-14 that he was bullied relentlessly in school. "I've always been really tall and lanky," the "Life of the Party" singer revealed. "People made fun of my skinny legs." Even more shocking, Shawn says that he still get tweets from people bashing his body. He revealed his message to those haters in the new issue of J-14, on stands now. Plus, there's an exclusive glossy pull-out poster from our shoot with Shawn! The issue is packed with more heartfelt confessions from stars. Read about how Debby Ryan got herself out of an abusive relationship, why Pitch Perfect 2's Anna Kendrick is secretly insecure, who Sabrina Carpenter really calls her BFF and so much more! Plus, take our "Why are you a trailblazer?" quiz, enter to win signed prizes from your favorite celebrities, and get all the spring fashion and beauty scoop you've been craving!